You may or may not have guessed it, but this is a book on Johannine studies. 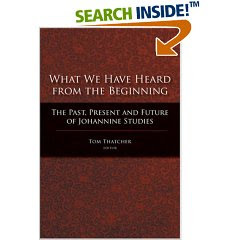 It's full title is What We Have Heard from the Beginning: The Past, Present, and Future of Johannine Studies (Waco: Baylor Press, 2007). Tom Thatcher has edited a very fascinating volume here. As he tells in the preface, he set out to write a sort of time capsule about Johannine studies, to introduce the major scholars of Johannine studies to the next generation of students who will carry on the discussion of the fourth gospel. He asked seasoned senior scholars to write conversational vignettes about his or her "journey with John." So the senior discussions include evaluations of the state of the field, programmatic remarks on meritorious questions, personal histories of research in the field, and summaries of current work - as Thatcher says, "anything that one might share with an interested student over coffee after class" (p. xvii). So these essays provide the reader with an overview of where Johannine studies has been and where it stands today. Then Thatcher asked a younger scholar who will be carrying on Johannine studies into the next several decades to offer brief responses to each of the senior essays, to reflect on their senior colleague's comments, to identify unanswered questions. So this is the future forecast of Johannine studies, where it is going, from the perspective of those who work in "the ongoing stream of Johannine tradition" (p. xviii). The senior-junior teams include: Ashton-North; Beutler-Claussen; Borgen-Labahn; Brodie-Williams; Carson-Köstenberger; Culpepper-Harstine; de Jonge-Kirchschlaeger; Fortna-Thatcher; Kysar-Rensberger; Martyn-Reinhartz; Moloney-Coloe; O'Grady-Lee; Painter-Anderson; Schneiders-Conway; Segovia-Lozada; Smith-Keener; Van Belle-Judge; van Wahlde-Just. I found the senior scholars' pieces to be engaging, and think that Thatcher achieved his time capsule. A very unique project. "Book Note", "Gospel of John"